Problems With Your Air Ducts? We Can Clean and Repair Them For You! Why Do Your Ducts Need Cleaning? The air ducts in your home work year-round to keep your home at a comfortable temperature, with heating in the winter and air conditioning in the summer. Unfortunately, sucking in air to provide these things also draws in dirt and dust. These contaminants start to accumulate over time, even more than you might think! Pounds of substances have been known to build up if left unattended. Your air is polluted from picking up these particles, and is spread all over your home. This means you and your family are breathing in contaminated air. Even those without health troubles will be affected by fatigue, but those with them will have an even harder time. People who suffer from asthma or other breathing disorders in particular are at risk for issues. Children and the elderly can also be negatively affected, and allergies are bound to be irritated. Aside from that, these blockages take a toll on your energy bill as well! It’s harder for the air to pass though, so your duct must work harder to do so successfully. If you’ve noticed your energy costs rising, this may be the first step in lowering them. Using the best tools available, we’ll be able to clear out your air ducts and get them looking like new again! It’s important to do this process carefully, otherwise the dust will only get dislodged and enter your home. That’s why our professionals will carefully loosen the clogs, then immediately vacuum them up to be disposed of easily. You won’t have to worry about cross-contamination, and you will be breathing easier shortly! Rather than letting your family suffer from bad air quality, it’s time to do something about it! 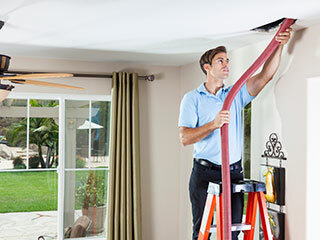 Call Air Duct Cleaning Simi Valley now, and let us take care of things. We’ll be in and out before you know it, and will deliver the best service available.